Pork brains, also referred to as offal, are consumed around the world, though they are most common outside the United States. You can purchase them at a local grocery store or butcher shop in fresh form, and some stores even carry them canned in milk gravy. This type of organ meat provides versatility, which means you can prepare it a number of different ways, including in a soup or stew, as part of an egg dish, breaded and fried, and in stir-fry. Prepare the pork brains for cooking by soaking them in cold water for about an hour or two, then immersing them in a pot of water, bringing it to a boil. Once they have reached a boil, reduce the heat under the pot to a simmer. Allow the brains to simmer for about three to four minutes, then remove the pot from the heat. Rinse the brains with cold water before you continue cooking them. 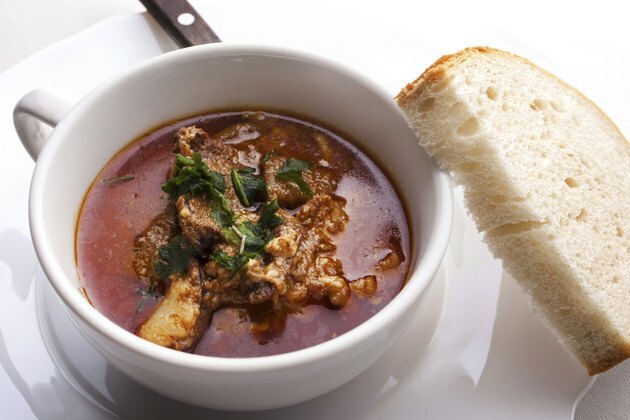 Use pork brains to make soup. Chop the brains into cubes and saute them in a couple of teaspoons of oil along with chopped onions and garlic. Once the onions are tender, add the broth of your choice, vegetables such as carrots and celery, and any other ingredients you want in your soup. Bring the liquid to a boil, then reduce the heat to a simmer. Remove from the heat once the carrots and other vegetables become tender. Mix pork brains with eggs to give a twist to the usual scrambled eggs. Chop the brains into small pieces and set them aside. Crack eggs into a bowl and beat them with a fork or whisk them with a wire wisk until the yolks and whites of the eggs are well mixed. Add any seasonings you wish, including salt and pepper, and any other additions you want, such as chopped peppers and onions. Add the brains and pour the mixture into a pan coated lightly with cooking spray. When the egg mixture starts to thicken, use a spoon or spatula to scrape the eggs away from the side and bottom of the pan, moving the eggs about until they are no longer runny. Bread and fry the brains in a small amount of hot oil. Slice the brains and dip them in a beaten egg or milk, then dip the moistened slices in bread crumbs seasoned with salt and pepper. Fry the brains in hot cooking oil until the slices are browned. Chop the brains into cube-like pieces and season them with salt and pepper. Heat a wok or large pan and add about 2 tbsp. of oil. Add the chopped brains to the pot and toss and stir them to cook the meat without allowing it to burn. Add stir-fry vegetables, if desired, and continue cooking until the vegetables are cooked throughout, but not soft and mushy. Pork brains contain a significant amount of cholesterol, so consume them in moderation.